Peel, clean, and rinse the shrimp. This will be the bulk of your prep time. Set aside in a cool spot. Prepare all vegetables and other ingredients (because the shrimp will cook so fast, you'll want to have things ready). Begin boiling water for pasta in a separate sauce pan. In a wok, heat olive oil on medium/high. Lightly saute garlic and green onion then add shrimp to hot pan. 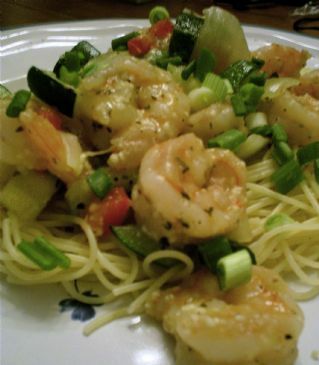 As shrimp cooks, add cooking wine and basil. Before shrimp has completely cooked, move shrimp to sides of wok. Add red pepper, onion, and zucchini. (If needed, add a few tbsp of water.) Cover for no longer than 4 or 5 minutes (depending on cooking temperature). Add pasta to boiling water. Check under lid. Veggies should be close to steamed. Mix shrimp in with vegetables and replace cover. Watch this carefully, making sure shrimp does not over cook, or it will be tough. If you prefer your vegetables more cooked, put them in before the shrimp with a little water. You'll loose some flavor, but you can control completion time better. When shrimp is done and vegetables are to your liking, turn off burner and uncover. Toss with cheese, pepper and tomato slices. Serve over 1/2 cup of pasta. Makes 5 1-cup servings over pasta. Recipe submitted by SparkPeople user SHELLBERTANN.